3 word quotes are short inspirational phrases with just three words.They are filled with wisdom and act as great motivators that we can repeat to ourselves often.This also makes it effective for using them as affirmations. The 3 inspirational words become intention setters when we use them often with easy reminders of them on stickers,magnets,posters and our coffee mugs too!Fill your mind with the success principles of life captured beautifully with just three words and bring on abundance in to your life. The 3 worded quotes also make great inspirational gifts for family, friends and business associates. I am artist and designer trying to explore ways to showcase my art and also earn online.Many times when I feel a dip in my enthusiasm in my solo journey of exploring the wide web for opportunities three word quotes has come to my help.Repeating them often to give me the positive vibrations has helped me a lot. I bring my concentration to the present moment by repeating "Do it Now" or "Seize the day" words.I motivate myself to go for my morning walks with the reminder of"health is wealth". I begin the day admiring and being grateful with the words "Life is awesome" and never losing hope when things go wrong with the comfort of the 3 inspiring words "All is well". 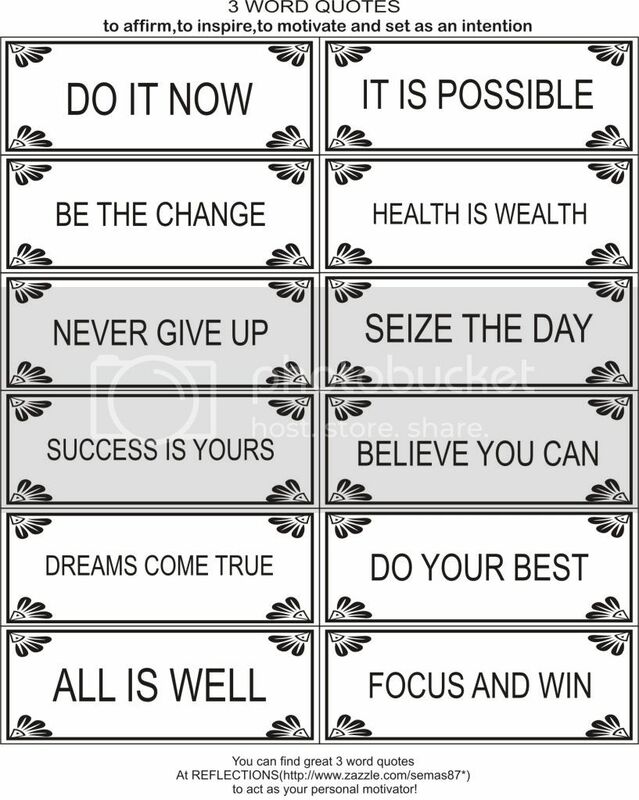 I wanted to share this wonderful energy giving words with all and created designs for my zazzle store.I made them available on various products.The 3 worded inspirational gifts has proved popular and I get sales of different words each day. I am happy to help someone get a pick up in energy using these inspiring three word phrases. Believe you can - These are the words I use to inspire myself when I feel things going tough. Your belief that you can will help you see what can be done in contrast to when you do not believe in yourself. At such times you will tend to magnify more on the problems and the possibilities get hidden behind your doubts and self pity.As soon as you start believing Yes,you can you see endless possibilities flowering before your eyes. This desktop wallpaper was designed at one such moment to help me affirm that I can indeed design well.This design is also one of my popular inspirational gifts available as a poster,magnet,cards,mouse-pads,etc at my zazzle store~REFLECTIONS . 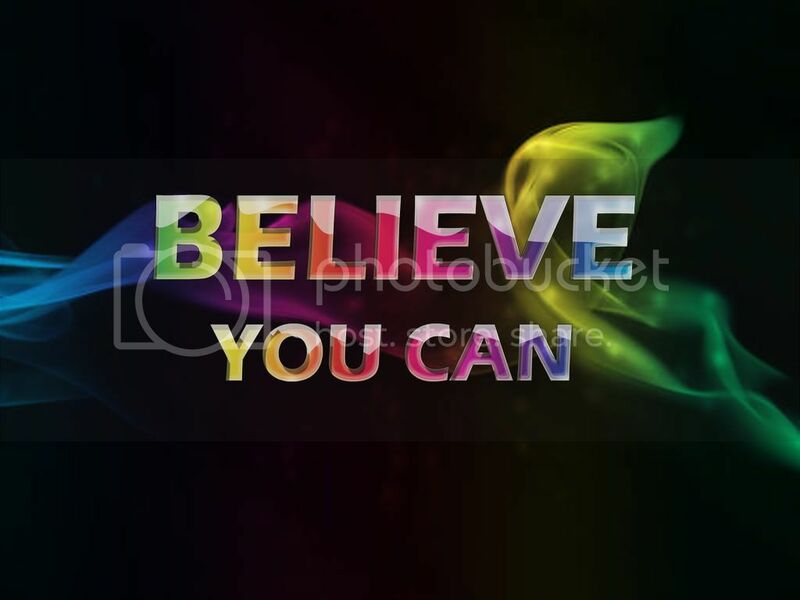 You can download it for your personal motivation.>>> "Believe You Can "
Life is Awesome ! It is in your hand to make your life awesome. Every day is a new experience and it opens up new opportunities .Explore them to renew yourself. Get out of your comfort zone to experiment new things.Only when you change will your life change. Keep learning.There is so much you can do to improve yourself. Take time to admire the small wonders around you.It is the beauty in them that makes life awesome. A concise book filled with some great suggestions that you can follow to make life a success. Only when we discover the purpose of our life can we find fulfillment and happiness.Nothing we get in life is accidental and all our intentions will become true when we work on the life rules. Here is a book to guide you on your mission to succeed. 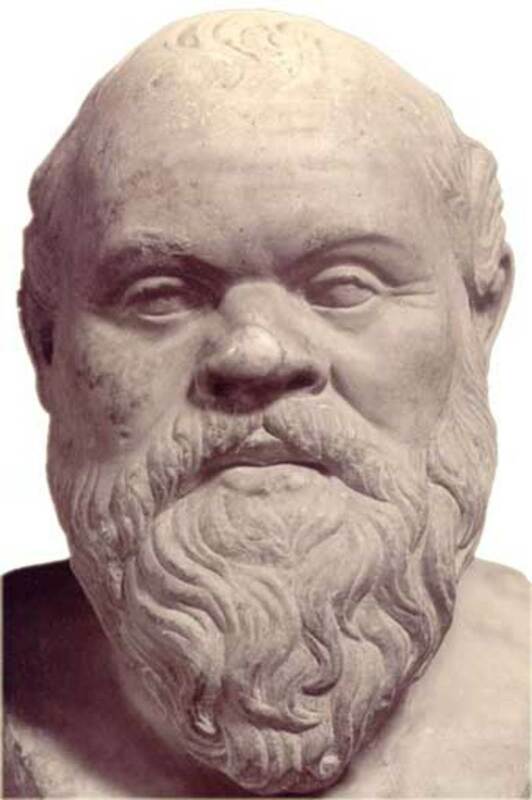 3 word inspirational quotes by famous people to inspire and motivate us! The Famous 3 word quotes are a compilation of quotes in 3 words by famous people curated from various resources on the internet .All quotations remain the intellectual property of their respective originators. Success is what everyone wants.The way to achieve this elusive achievement is by learning the secrets that will help you make the right choices. A law of attraction book that will help you guide you to manifest your dreams and goals to make your life a success. What we believe we can achieve and what we see with clarity will become a reality.The process of visualization helps you seeing with your mind's eye what we want to create and take action to make them a reality.Let these books help you understand the power of visualizing. Do your best should be your mantra if you want success to follow you. Doing your best gives you an advantage over others who do just what has to be done. Our actions give results in proportion to the efforts we put in ,what we sow we reap. Enjoy the benefits of giving it your all to your career by seeing the fruits return in money and fame. Be respected and looked up to when you are seen giving your best. The sky is the limit when you move forward in remarkable speed always improving on your skills. Don't Waste Your Talent is a great book that conveys you the importance of having a focused vision and strategic planning .These are the cornerstone that will give lasting benefits and success in whatever you choose to do. Tony Buzan the creator of this wonderful concept of mind maps guides you in this book,How to Mind Map,on how to maximize your brainpower and radically improve your performance.It is a system of planning and note taking that brings forth your creative side to accomplish your activities with ease. Which is your favorite 3 words? Never Give Up -remember these powerful words to motivate yourself when you feel yourself pulled down by self doubt and a loss in self confidence.You have to persevere with persistence and determination to reach your goals. Only when you strive hard against your difficulties with a never give up attitude can you feel your true strength and also enjoy the success of winning the challenges of life. Your attitude with a never giving in to a set back will make you leader and star among the people who put you down when you come away winning your sweet victory. Be inspired by Joyce Meyer's words to Never Give Up! A popular author of inspirational books and a leading Bible teacher her words will motivate you to face life's challenges with determination. Danny Cox, shows us the path to high performance in seven achievable steps in this book.Seize the Day: 7 Steps to Achieving the Extraordinary in an Ordinary World He enlightens us with success stories and wisdom of people who have achieved much in life to show us that we have to seize the day with a quest for excellence in whatever we do. 3 word quotes are great to have on hand to affirm,to motivate,to inspire and set as intention. You can just print the three word quotes on paper and cut along the outer line to make them in to motivation cards. You can see them often to imprint them in your mind . 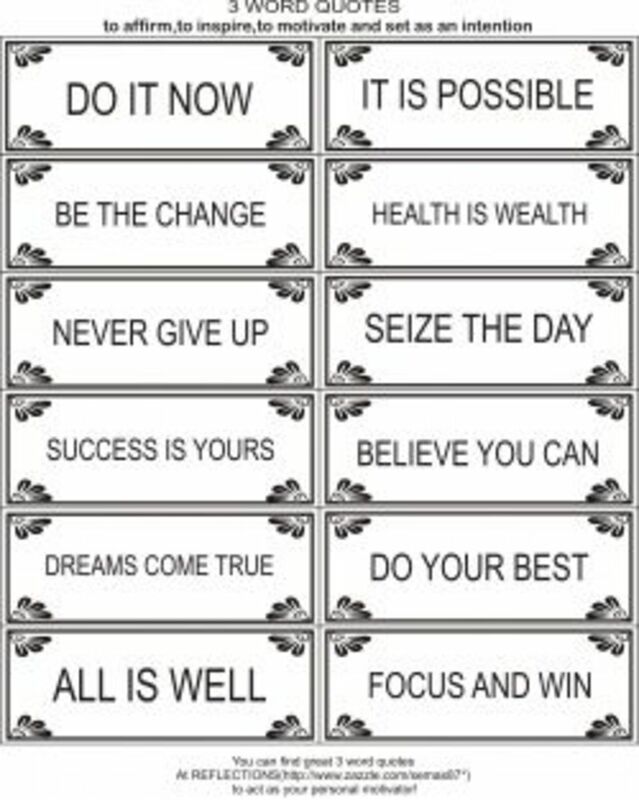 Another way to remember them easily is to have fridge magnets with 3 word quotes or mousepads with the motivating words.Mugs and keychains also act as motivators when they have these words printed on them.Stickers with the three words make them easy to stick them at various places for quick inspiration. Check out the products with great 3 word quotes at REFLECTIONS to act as your personal motivator!Please check often as I keep adding new 3 word quotes in different attractive designs frequently. Please click the link to download>>>three word quotes. This is a fantastic lens. I wondered what I would find in three words. Big Thank You! @prakash-mishra-9212: Thank you for sharing Brian Tracy's inspiring quote. I love these quotes. There is another one from Brian Tracy "Dream Big Dreams" . @Mary Stephenson: "Let it go "and "In the moment" are inspiring 3 word quotes to keep one grounded.Thanks for sharing them. What works for me when frustrated or anxious. "Let it go!" and "In the moment!" I have these highlighted in front of my computer screen. This is a great lens on Squidoo. Once again, loving your lenses. I'm about to check out your one word quotes. Great lens. Motivational quotes need not be long to inspire someone. Hey Sema, very interesting take on a great topic. Thank you for these inspirations! I have a lens about self-improvement that I think is complimentary to yours - its all about new paradigms for change and reaching goals. I'd be honored if you gave it a read and let me know what you think. Either way, thank you for this cool lens! I didn't realize 3 word quotes could be so inspiring. Great lens. Great 3 word quotes. Inspirational and motivating. Enjoyed reading. Thank you. Great lens, it made me smile and reminded me to "Keep Moving Forward". Thank You for sharing such great inspiration. "Never give up" is my favorite. These are great quotes. Like the Never give up and knowledge is power. Thank you for this inspiring article. I enjoyed all of the great quotes. Amazing lens ! Great info. Thanks. Cool. I was looking for positive short quotes to use on my artwork. Thanks. What a unique lens idea! I really enjoyed reading it ... thanks! What a great way to start my day with these inspiring three word quotes! Three words is all it takes sometimes. Good Lens! There's certainly plenty to feast the eyes on here. 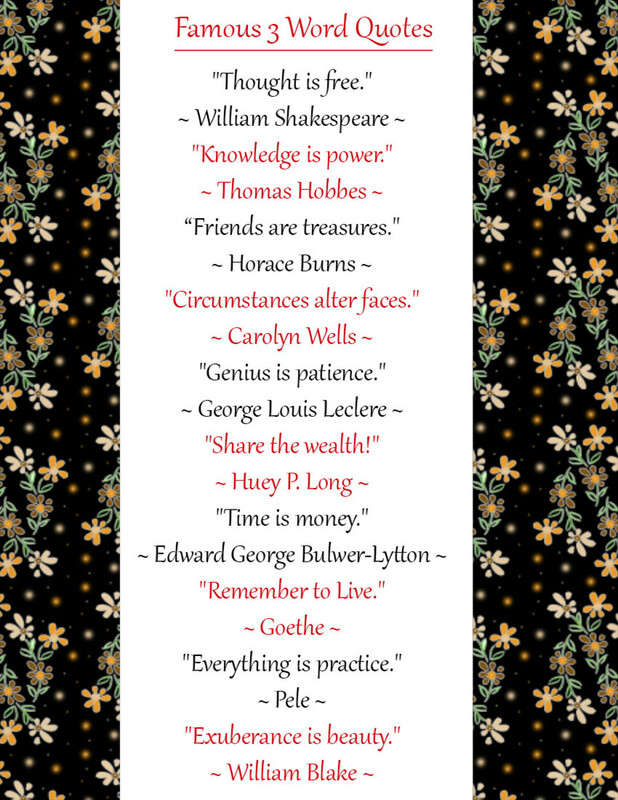 Most of these quotes really work well as affirmations. Thanks for the thought provoking material. Beautiful 3 words quotes. Thanks. Wow! You are truly the Queen of Quotes! Thanks for all your great lenses! Be the change is a good truncated version of Be the change you wish to see in the world. Seize the day is another popular one too. Simple, yet so inspiring. Blessed! enjoyed the positive lens, these are always good to see. Another great collection of quotes! love Coach Wooten. Valuable presentatation. Thanks. What a great site. THREE WORDS gets right the point! If you ever feel a need to ! raise your spirits, come on over! Some great information. It is funny how something as little as three simple words can change a life if used in the right context with the backing of belief. My goodness this sure is inspiring, and a great way to start my day. Thanks, and a blessing! Super lens....I like NEVER GIVE UP!! Simple and Powerful Inspiration. My favorite. Thank you! Really enjoyed the quotes and your beautiful creations. This was a very smart and witty lens! I liked it a lot! Seize the Day is my personal favorite dahling. This lense is so powerful and inspiring! Thank you! My favorite 3 word quote is All is Well. It makes me brave to face the problem. Here's a three-word quote that I love as a reminder of who we are: "All is One." What power three words doth contain! wow , great, creative show. Great lens :) Really motivating! wonderful quotes, 3 words only, very extraordinary, well designed lens. Just featured and kind of reviewed this lens on my Top 5 lenses from my Squidoo Neighbours lens. 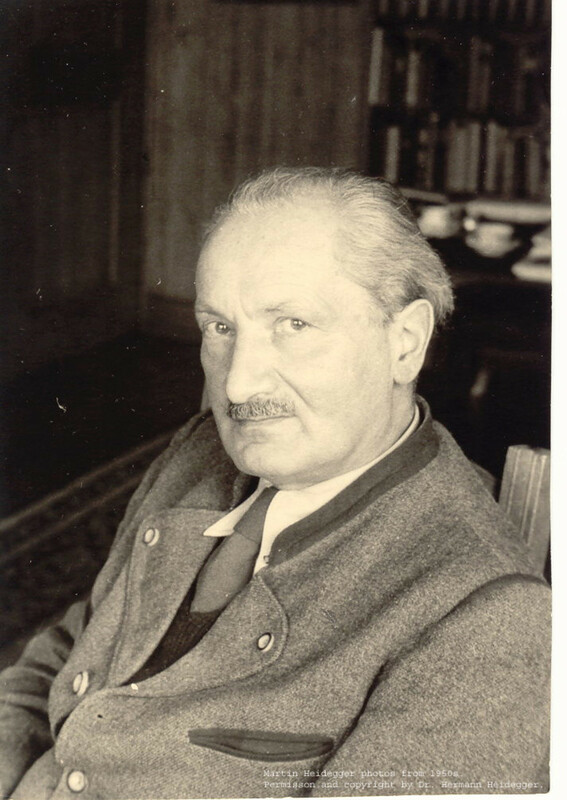 I will be glad to have your visit and feedback on it! Some very powerful 'three word quotes" and entire lens on just "three words" brilliant! Thank you I needed this today...was a rough day, but now it's alittle better. Shine On! Great and very inspirational. Thanks! I've long used quotes to inspire and motivate myself. But I'd gotten away from using them the way I used to. Thanks for the reminder. Beautiful lens, very uplifting. Lensrolling to Favorite Rumi Quote many thanks. Beautiful work on 3-word quotes. I like these short and sweet quotes that help motivate...well done! Holy cow! Who would have thought you could make a whole lens on three word quotes. And the Zazzle products are great, too. Love the green, white, and black magnets. I have one from Finding Nemo - "Just Keep Swimming." - Dori LOL Loved the lens! Though maybe a little too many products for my taste.